REMINDER FOR YOU: This is posted April 2018, Wunder may release new packaging in the future if you're still reading this and may not be updated anymore. I am also comparing the one I bought online for a cheap price vs the Wunderbrow I received from the Press Release of Wunder official launch here in the Philippines. I'm delighted to receive a good feedback from my readers from my series posts on how to spot fakes now I decided to create a new one which is Wunderbrow - which is a known eyebrow brand for the following -proofs reasons: Smudgeproof, Waterproof, Transfer proof. Mentioned as well as a beach tested product from my previous blog post. 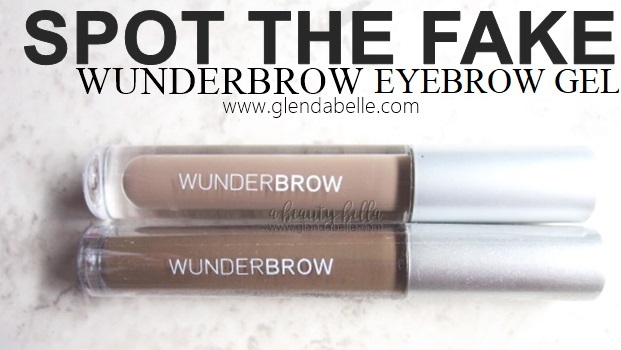 The fake Wunderbrow costs ~Php 60 or around US$ 1.15 depends on where you buy it. Authenticity if the price is too good to be true and if it's from official stores and resellers of the brand. However, some might check out Amazon, eBay, or buy from non-official stores for some reasons. I'll be sharing how we can compare the fake vs the authentic Wunderbrow. Packaging should evenly show the tube shape and must be well-molded like this. It should exactly the same as their product photo listed on the website. Fake's sticker at the bottom has a fail print, poor spelling and a bit glossy, unlike the authentic's sticker. The applicator is different as well. Authentic Wunderbrow's brush has more brush hair than fake as shown in the picture. When applied to skin, I find the fake one oily and uneven when applied. It's too runny compared to the authentic. Fake Wunderbrow can be wash off by rubbing with water and not long lasting. So these are the main keys to spot the authentic and fake Wunderbrow Brow Gel. 1 comment on "How to spot the fake Wunderbrow"
Wow! The difference is astonishing! A friend of mine unintentionally purchased a fake one recently and I'm glad I found this post before I make a purchase. Wunderbrow is now in the Philippines!